Home » » Nigerian Man 'Fights' His Late Father in the Grave for Including His Female Children in His Will. 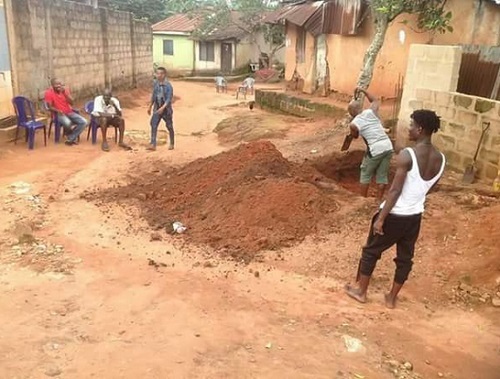 Nigerian Man 'Fights' His Late Father in the Grave for Including His Female Children in His Will. The late Gabriel Okwukogwu may not be resting in peace in his grave after all, as he was said to have attracted the anger of his first son, simply known as Emmy for sharing his properties among his seven children including the four women in Anambra State. It was gathered that an infuriated Emmy reportedly went to his father’s grave to tell him that he will not comply with the will he prepared when he was alive. The family is from Orlu in Imo State but stays at G.M.O Road in Ogbaru area of Onitsha metropolitan city in Anambra. It was gathered that Emmy who resides in Lagos returned after the death and burial of his late father. After the burial the late father’s lawyer called the members of the family, presented their late father’s will and read it to the children for implementation. However, trouble was said to have started after the counsel got through reading the will and Emmy discovered that their late father shared his properties to his children including the women among them. It was gathered that the late Okwukogu had properties both in Onitsha and Owerri which he shared equally among the children not minding the gender status. It was gathered that when the lawyer finished reading the will to the children, Emmy got angry and declared that the will did not come from their father because he really understood the culture and tradition as observed in Igbo land. It was gathered that the culture did not recognise women because it was expected that they will get married to their husbands and therefore were not entitled to inherit any property from their family. Thus Emmy insisted that the culture and tradition will be applied in the sharing of the properties. An infuriated Emmy reportedly left the meeting and headed to their family house in Orlu, went to his father’s grave and protested; that he will not comply with his purported will because he did not comply with the laid down customs and tradition in the land. It was gathered that Emmy’s decision to reject the will was causing serious problem in the family as the women in question threatened to fight for their rights as contained in the will rejected by their eldest brother. When P.M.EXPRESS spoke to some Igbo leaders concerning the incident, some spoke against the sharing and declared that Emmy was right because women werr not entitled to inherit family properties according to tradition. Others said that it was the old practice and the properties in question were not family houses which the women will never inherit according to tradition. It was however not certain how the matter will be resolved because the will was regarded as a valid document that must be complied with despite any perceived defects.